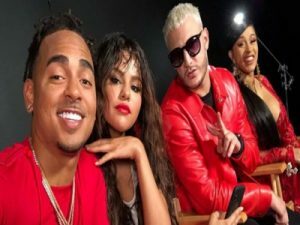 “Taki Taki” is a DJ Snake produced song influenced by Reggaeton, featuring a trio with Latin roots: Ozuna, Cardi B and Selena Gomez, singing in both Spanish and English. In the song, the artists talk about dancing and the possibility of how love could go much farther through dancing and teasing. Taki Taki has no official meaning, and it is believed that is used in the song just for better sound.